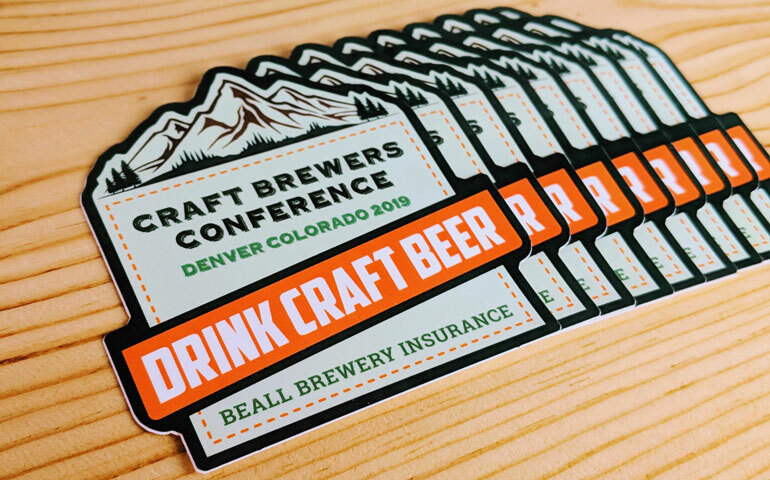 Beall Brewery Insurance will be onsite at the 2019 Craft Brewers Conference in Denver, Colorado, and they have custom shaped die cut stickers that will be available for those that stop by their sponsored lounge named Camp Beall. They're inviting attendees to join them in Lounge 10 to recharge and relax. They'll offer you a s’more and coffee, give you space to check your email or charge your phone—and give you the chance to enter their drawing for a Yeti Hopper 18 Flip Cooler. The first 100 people to arrive at 11 AM Tuesday and Wednesday will receive a Yeti Rambler travel mug. The experienced and knowledgeable professionals at Beall Brewery Insurance can customize a craft brewery insurance package that meets your brewey's budget and covers your microbrewery, contract brewery, or brewpub so that you can feel confident about the future and focus on what you do best: brewing great craft beer. Beall Brewery Insurance is a craft brewery insurance program with clients throughout the United States, and they're a subset of Beall Insurance, with offices in Newport Beach and Redlands. They are a proud member of the craft brewery industry's top associations, and they provide their customers a comprehensive look at how craft breweries can reduce their exposure to loss and operate safely. For over 25 years, Beall Insurance has been independently owned and operated to handle a variety of insurance needs, and their Brewery insurance helps create custom solutions for craft brewers. We are glad to support their efforts at the 2019 Craft Beer Conference, and we hope that attendees stop by Camp Beall to relax and recharge...and to learn more about how their insurance products can help secure your business.